Thanks to very generous donations, we met our 2nd goal and raised it again! Venkman's first training video is now up, too. She ran 1.3 miles today! Venk's got her Rocky-look going with the hoodie. Wow you guys! We hit our $100 goal on the first day! Venk had better start stretching. 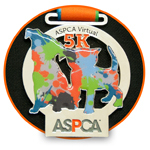 We're upping our goal to see what more we can do for the ASPCA this month. It's midnight as I write this, but expect a Venkman training update in the morning.